So you’ve bought a new Windows 10 PC (or nuked your PC), and want to put a bunch of programs back on it again like Chrome, GIMP, Malwarebytes, Skype, Steam, VLC, iTunes, etc. 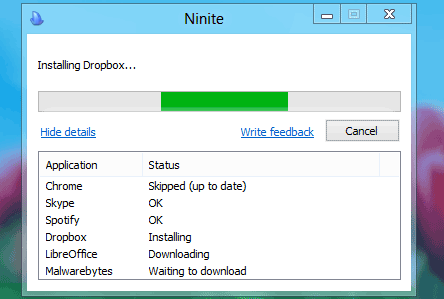 Ninite.com allows you to tick the boxes for the programs you want to install, then download and run a single installer and it will take care of the rest. Even better it does an unattended install – meaning you don’t have to click Next, Next, Next. It will download and install multiple applications one after the other without pausing or waiting for your input. Also it automatically deselects the horrible addons like Ask toolbars and other nonsense some of these free programs come with. And if you already have the program installed, it just updates it to the latest version. Oh, and ninite is completely free, no registration, nothing. By far the best way to install apps on a new PC or after nuke and reinstall.